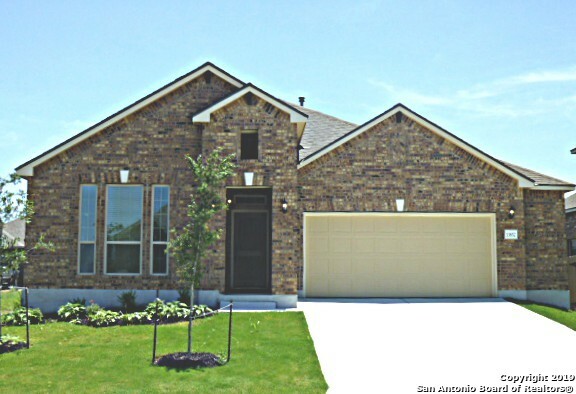 All Waterford Park homes currently listed for sale in San Antonio as of 04/18/2019 are shown below. You can change the search criteria at any time by pressing the 'Change Search' button below. 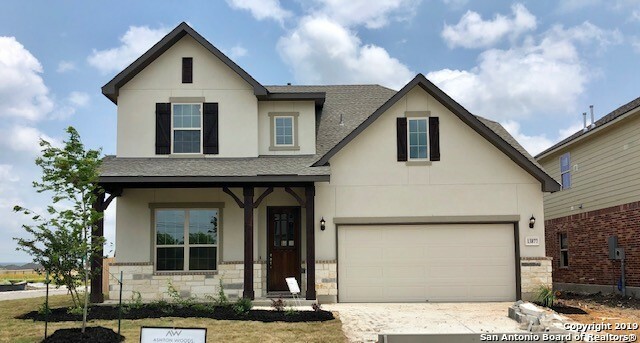 "New Armadillo Home Ready to Move-In May 2019. Beautiful 2 story plan with 4 bedrooms, 3 1/2 baths, study and game room. All stainless steel appliances with roll in range. Extended covered patio. Over sized 2 car garage, ceramic tile throughout first floor except master bedroom, upgraded front door, 4 1/2 baseboards, garage door opener, full landscape (all 4 sides) with irrigation system, ceiling fans at family, master and game room, granite @ kitchen, 42 birch cabinets w/ crown molding @ kitch"
"This home is under construction with an estimated April 2019 completion. Beautiful one-story home with 3 bedrooms and 2 baths. Gourmet kitchen with built in stainless-steel appliances and gas cook top. Spacious family room and separate dining room, extended master bedroom, elegant double front door and beautiful wood flooring in main living areas. Master bath features private bath with a garden tub, mud set shower and double vanities. The home also includes a covered patio. Large utility room." "This home is under construction with an estimated April 2019 completion. Beautiful two-story home with 4 bedrooms, 2.5 baths and a study. Gourmet kitchen features built-in stainless-steel appliances with double ovens, a gas cook top, and a walk in pantry . Spacious family room with a stone fireplace, cedar wrapped beams in family room. Tile flooring in main living areas. 8' front door. Master suite with a private bath featuring a garden tub and a mud set shower. Covered patio. Three bed. and l"
"WAS $331,870, NOW $324,990! Imagine entertaining in a grand, open kitchen w/high-end finishes like granite & a stainless steel 5-burner gas range. Storage galore in this very popular plan. 4 beds & 3 full bath, PLUS a study. 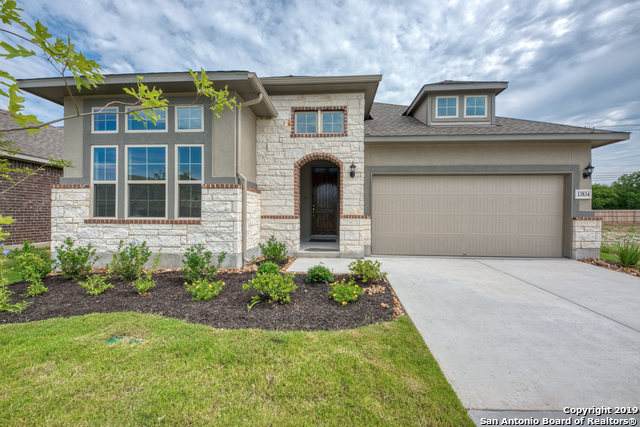 Master suite boasts Texas-sized walk-in shower, HUGE walk-in closet, & his/hers sinks. Full sod/sprinkler at front & back. 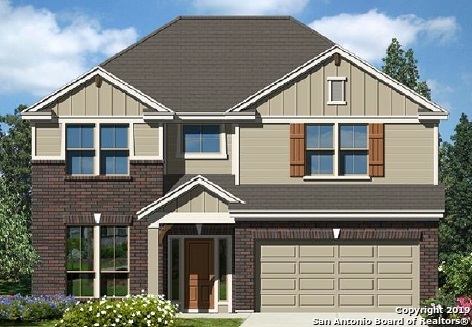 A perfect single story home located in San Antonio's most desirable master-planned community! **PHOTOS OF SAME PLAN, NOT ACTUAL HOME**"
"This home is under construction with an estimated April 2019 completion. Beautiful one-story home with 3 bedrooms and 2.5 baths. Gourmet kitchen features built-in stainless-steel appliances, a gas cook top, walk in pantry and walk through to the dining room. Spacious family room with three large windows looking out onto the covered patio. Elegant double front door. Master suite with a private bath featuring a garden tub and a mud set shower." "New Armadillo Home Ready to Move-In March 2019. Beautiful 1 story plan with 4 bedrooms, master bay window and 2 baths. All stainless steel appliances with roll in range. Extended covered patio. 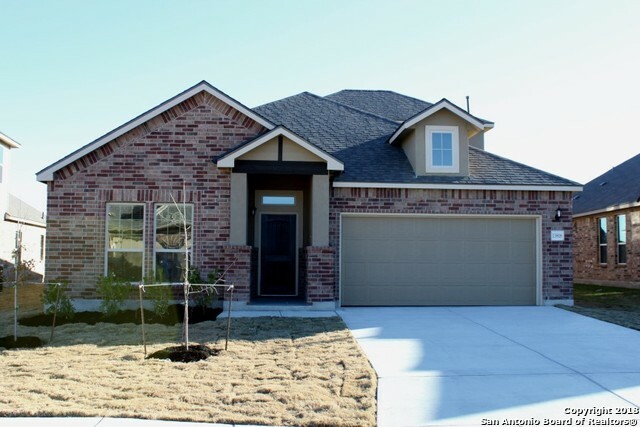 2 car garage, ceramic tile throughout except bedrooms, upgraded front door, 4 1/2 baseboards, garage door opener, full landscape (all 4 sides) with irrigation system, ceiling fans at family and master, granite @ kitchen, 42 birch cabinets w/ crown molding @ kitchen, 36 shaver height vanity @ master." "STUNNING 5 BEDROOM / 3 CAR GARAGE HOME W/ SOLAR PANELS WILL SAVE YOU TONS OF MONEY !! This Immaculate home in Pristine condition features a spacious Master Down, ample sized bedrooms /closets, Gameroom and Large Back yard w/ covered patio w/ tiled flooring. Other features include Granite kitchen counters, full yard sprinkler system, water softener, back yard shed, gutters and epoxy coating to garage flooring. Don't wait, See this home today !!" "This home is under construction with an estimated April 2019 completion. Beautiful one-story home with 4 bedrooms and 3 baths. Gourmet kitchen features built-in stainless-steel appliances, a gas cook top, walk in pantry and a large center island. Spacious family room with three large windows looking out onto the covered patio. Private study perfect for a home office. Master suite with a private bath featuring a garden tub and a mud set shower." "This home is under construction with an estimated April completion. Elegant one-story home with 4 bedrooms and 2.5 baths. Gourmet kitchen with built in stainless-steel appliances, gas cook top, granite countertops and center island. Beautiful wood flooring in main living areas. Master suite features private bath with a garden tub, oversized mud set shower and separate vanities. The home also includes an extended covered patio perfect for outdoor entertaining." "New Armadillo Home Ready to Move-In March 2019. Beautiful 1 story plan with 4 bedrooms and 2 baths. All stainless steel appliances with roll in range. Extended covered patio. Oversized 2 car garage, ceramic tile throughout except bedrooms, upgraded front door, 4 1/2 baseboards, garage door opener, full landscape (all 4 sides) with irrigation system, ceiling fans at family and master, granite @ kitchen, 42 birch cabinets w/ crown molding @ kitchen, 36 shaver height vanity @ master, pre plummed"
"New Construction. Home ready for move in. Beautiful 1 1/2 story with 4 bedrooms, 2 baths and large game room. All stainless steel appliances with gas range. Covered patio, 2 car garage, ceramic tile throughout except bedrooms and game room, vaulted ceiling at master, 8ft walk in shower, upgraded front door, 4 1/2 baseboards, garage door opener, full landscaping with irrigation system, ceilings fans in family, master and game room, granite @ kitchen, 42 birch cabinets w/crown molding@kitchen"
"This is one nice house, looks and feels much larger than the square footage and has all the room you need! There's 4 full, nice sized bedrooms plus the office could be a 5th bedroom as it does have a closet. The kitchen, dining, & family room are all open and ready for your big family get togethers! Upstairs has a cozy (but big!) loft that could also be your media room. The patio extends the full length of the back of the house, half of which is covered for your bbq's. 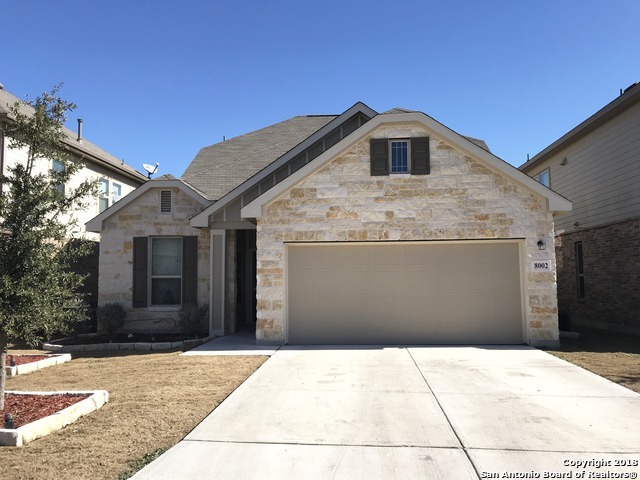 Seller will re-sod the b"
"Beautiful open floor plan 2018 Lennar home ready for a new family lot sits on a cul-da-sac with spacious back yard. Gourmet kitchen with white tile back splash, quartz counters, large size island overlooking living area great for gatherings! Gorgeous wood style flooring throughout home carpet in bedrooms with quartz counters in both bathrooms. 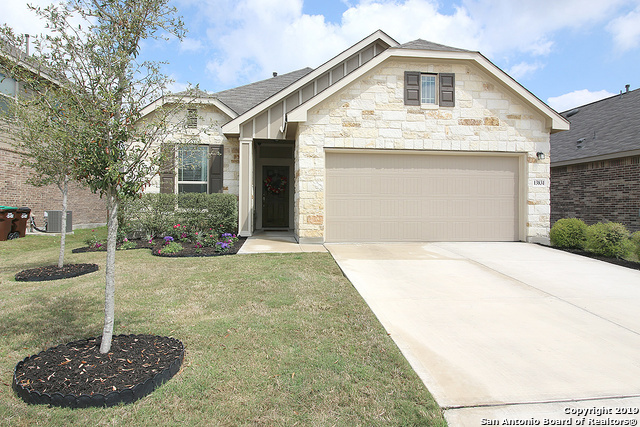 Stainless steel appliances, sprinkler system, covered patio and wood blinds. Lots of upgrades for price ** PLUS offering $ 1,500 in sellers concessions"
"This home is newly completed and ready for immediate move-in. Beautiful one-story home with 3 bedrooms and 2 baths. Gourmet kitchen with built in stainless-steel appliances and gas cook top. Spacious family room, extended master bedroom, 8' front door and Apron-Front under mount single bowl sink. Master bath features private bath and garden tub and mud set shower and double vanities. The home also includes a covered patio." "Price just reduced $13,000 for quick sale! *Over 2700 Square Feet* Beautiful 4 bed, 2.5 bath located in Waterford Park. Open floor plan, with high ceilings, granite countertops, and stainless appliances. Large kitchen island, gas cooking, and breakfast bar area. Master bedroom downstairs with spacious master bath and closet. Spacious game room and secondary bedrooms upstairs. Covered patio with large deck area. A great house for entertaining!" "Unique and Open floor plan, 1.5 stories, 4 bedroom, 3 full baths, game room/mother-in-law suite with bedroom & bathroom upstairs. 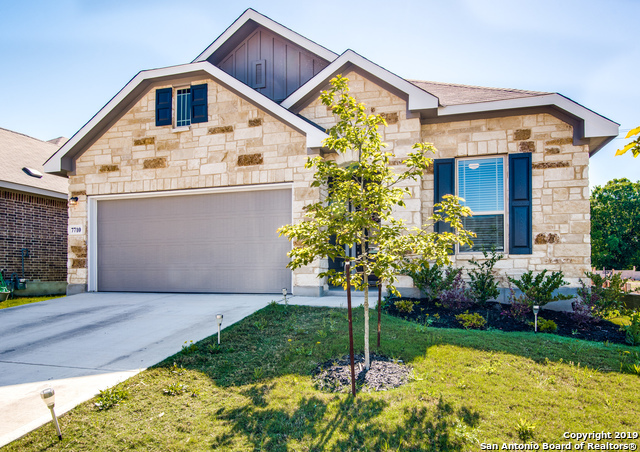 Ceramic tile in all wet areas, gas stove, granite counter tops, stainless steel appliances included, separate tub/shower in master bath with double vanities, cultured marble counter tops in bathroom, lots of closets & storage, covered patio, sprinkler system & Energy Star Certified. Close to Alamo Ranch dining & shopping. 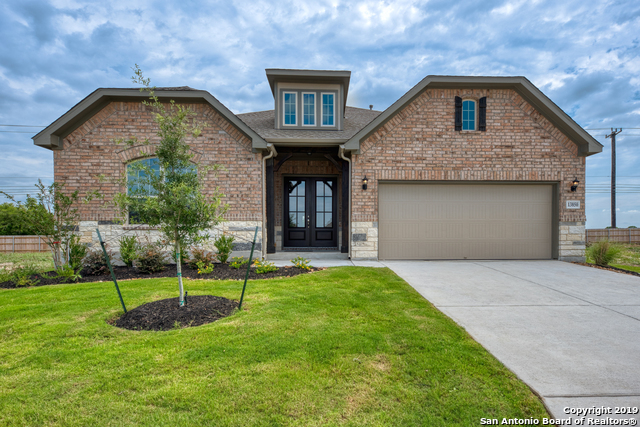 Easy access to HWY 1604, 211, 410 & HWY 151"
"This beautiful one-story home offers 1,771 square feet of living space. High ceilings are in the foyer and keep the space open until you head into the study. As you enter the kitchen, an island countertop overlooks the dining room and a spacious family room. The kitchen features granite countertops, 36 flat-panel stained wall cabinets, and ceramic tile backsplash laid on diagonal. The master bathroom includes a 36 x 36 separate shower with tile surround and garden tub." "Priced below market & ready to go! 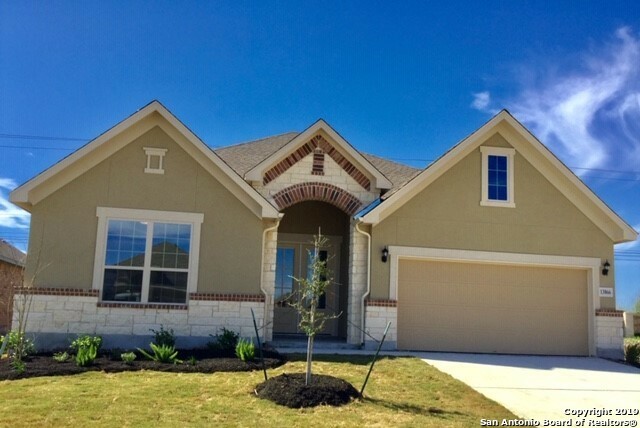 Immaculate and beautiful Lennar almost new home with all the bells & whistles! Chef's will love the open kitchen with granite counters, tile backsplash, 42 inch cherry cabinets w/crown trim, stainless appliances including a gas stove, huge pantry & extra large island for seating! Glass doors open to the downstairs study! Two huge living areas! 18 inch tile floors in entry, kitchen, dining & baths! Full sprinkler, garage door openers, water softener & more!" "~Waterford Park~ The Abby floor plan from the Barrington collection. This single story 3 bedroom 2 bath home boasts an open floor plan." "Gorgeous single story home w/grand, open Kitchen featuring gas cooking + an over sized granite island perfect for entertaining. 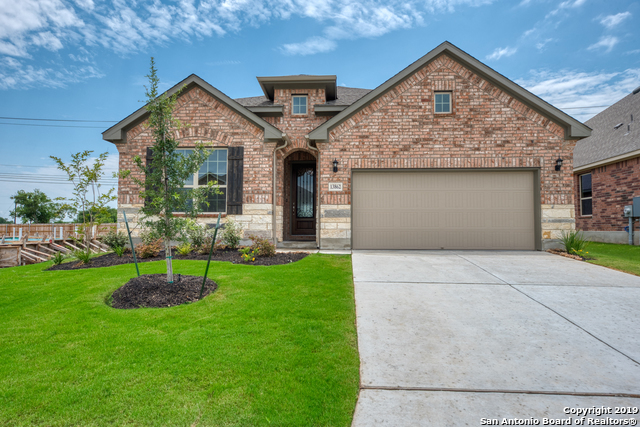 Move in ready, 2016 built home features an open floor plan, oversized tile + fresh interior paint. Kitchen overlooks Dining Area + a 18x15' Living Rm. Large 14x12' Master Suite. Master Bath boasts garden tub, walk-in shower & his/hers sinks. Full sod/sprinkler at front & back. Covered Patio. Great NISD schools w/Harlan HS minutes away. 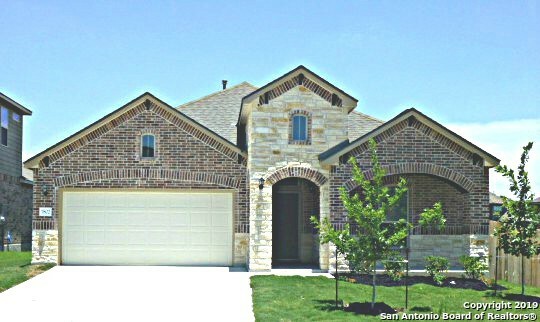 Close to Culebra/1604 Restaurants "
"~Waterford Park~ The Roffee floor plan from the Barrington collection. This single story 3 bedroom 2 bath home boasts an open floor plan."